Ro Khanna, Larry Lessig: Why Silicon Valley can't put a techie in Congress. 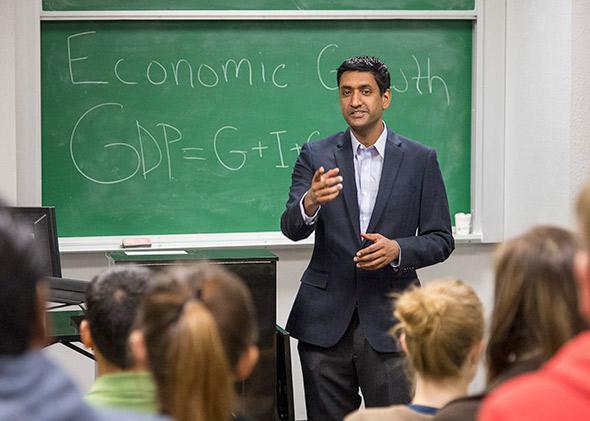 Ro Khanna lost despite heavy backing from the tech industry. Iowa sends farmers to Washington. Texas sends cattle ranchers. Why doesn’t Silicon Valley send a techie? On Friday, Ro Khanna, a 38-year-old technology and intellectual property lawyer, conceded defeat in his bid to represent the heart of Silicon Valley in Congress. He narrowly lost to Mike Honda, the 73-year-old incumbent, despite spending more than $4 million raised from the likes of Google’s Eric Schmidt, Facebook’s Sheryl Sandberg, and Yahoo’s Marissa Mayer. Honda’s hard-fought victory reveals that the Silicon Valley of Election Day remains a markedly different place than the Silicon Valley of popular imagination. We feel for a long time that Silicon Valley just hasn’t been properly represented at a federal level. We haven’t had the young, dynamic, hard-driving candidate that really understands the unique issues facing Silicon Valley right now. … I think we’re starting to come into a realization of our own power and our own capability, not just as innovators and technology pioneers, but also in a political sense. Honda, in contrast, is a seven-term incumbent from an older guard of liberal politics. His support came heavily from labor unions, and his campaign sought to portray Khanna as an elephant in donkey’s clothing. Whereas Khanna is a recent transplant, attracted to the Bay Area by its booming tech economy, Honda’s roots in the region date to a different chapter in its history. As a baby, he was shipped with his family to a Japanese American internment camp, and his parents worked as strawberry sharecroppers in San Jose back when Silicon Valley was a hub for agriculture rather than the Internet. Honda embodies Silicon Valley’s heritage as much as Khanna embodies its changing face. In many ways, Khanna’s showing was impressive. He captured some 47 percent of the vote against a relatively popular incumbent from his own party. Young Silicon Valley types have also struggled in local and state races. An acquaintance of mine, Kai Stinchcombe, mounted a brief run for State Assembly in 2009 as a 26-year-old startup founder and Stanford grad student. He dropped out when another tech-friendly Democrat, 40-year-old Josh Becker, entered the race. Ultimately Becker lost too, despite raising the most money. The seat went to Rich Gordon, a 61-year-old veteran of San Mateo County politics. I asked Stinchcombe, now 31 and the CEO of a fraud-protection startup for elderly people, why he thought the “tech candidate” approach hasn’t much resonated in the Bay Area. He pointed out that, for all their money and visibility, tech workers form a minority of the electorate even in Silicon Valley, and they can be perceived as entitled and out of touch. What Silicon Valley techies sometimes overlook, Stinchcombe added, is that they don’t necessarily need to put a software developer or an IP lawyer in Congress in order to have their interests represented—any more than Hollywood needs a movie star or Wall Street needs an investment banker. He pointed to 66-year-old Rep. Zoe Lofgren, D-California, who just won her 11th term in the San Jose-based district adjacent to Honda’s. In many ways, he said, “Lofgren has been a more effective advocate for the tech community than the tech community has. During SOPA and PIPA, she was the one telling Google” to get its political act together.